Strawberries are by far, one of our most favorite fruits. Over the summer, photos of bright red, juicy and sweet, Japanese strawberries were all over Instagram. To get a taste of these, I would have to go to Japan since I haven't seen any of this type of berries in our local supermarket. 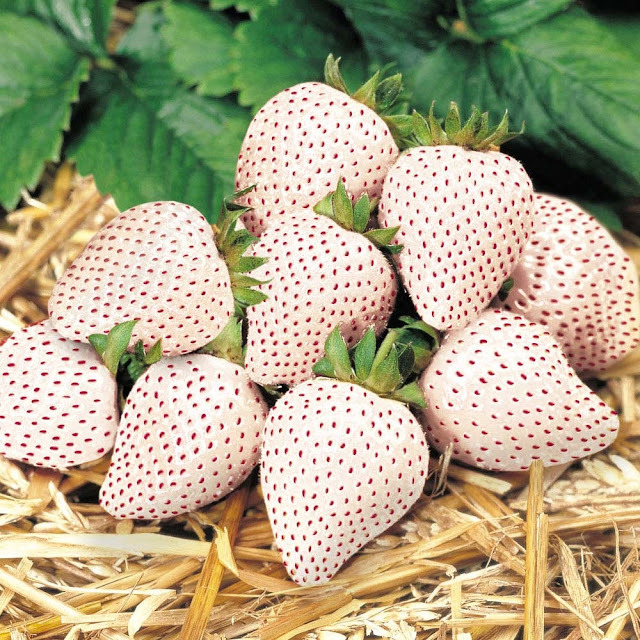 I found this photo of white strawberries online. Described as amazingly sweet and rich, these special Japanese variety are mainly used as presents for birthdays and weddings. The insides of the strawberries are white, while the seeds are red. Driscoll's brand of premium fresh berries from California are locally available in select supermarkets in Metro Manila. They come with a hefty price tag, about Php 450 for one pound of strawberries. I just slice them up into pieces and keep in the refrigerator. My daughter always comes home hungry from school and her first destination as soon as she gets home is the kitchen, to get a snack. Ice cream topped with strawberries. We discovered Sans Rival Chips last weekend at the Baker's Dozen in Power Plant Mall. or just simply drizzle with condensed milk. Loaded with vitamin C, fiber, folate, potassium and antioxidants, these berries are super good for you. I just hope that organic strawberries will be made available in our local markets. I wash fruits and veggies with either baking soda or vinegar but organically grown and free of synthetic fertilizers and pesticides will still be the best. We love Driscoll's too! It's such an indulgence but so very much worth the cost compared to the regular styrofoam-packed strawberries in the grocery.